Starting in 2015, INCITE and the Columbia Center for Oral History Research (CCOHR) undertook an oral history project documenting the transition to democracy in Tunisia. By speaking with current and former leaders, intellectuals, and members of civil society, we aim to capture the unique Tunisian experience and to create an archive for scholars that will help them better understand the transition to democracy. The full archive is now available at the Columbia Center for Oral History Archives. See the collection contents here. The objectives of the Tunisian Transition Oral History Project are twofold: (1) To document and interpret the events of revolutionary and transitional Tunisia (late 2010 to late 2015) from the perspective of prominent transition leaders in the technical government and in civil society, and (2) To understand the technical government as “answer” to outstanding revolutionary demands; and how it was implemented and functioned. The interviews chronicle revolutionary (December 2010 to January 2011) and transitional (Ghannouchi and Essebsi governments, 2011; Jebali government, December 2011 to March 2013; Ali Laarayedh government, March 2013 to January 2014) events in Tunisia from the vantage point of the close of the yearlong technical government experiment led by Prime Minister Mehdi Jomaa (January 2014 to December 2015). Narrators touch on their childhood memories of Tunisia, their coming of age in relation to Tunisian politics, directions in which their diverse careers took them and the distance from which they observed the deterioration of possibilities for political pluralism, popular contestation and basic civil rights in Tunisia’s so-called democracy during the era of abdicated president Zine El Abidine Ben Ali. They describe their experiences during the revolution itself, whether they took part in the demonstrations in Tunis or simply followed events secondhand through family members, from countries like France or the United States. They illuminate the precarious political situation represented by the shutdown of the National Constituent Assembly following the assassinations of prominent opposition leaders Chokri Belaid and Mohamed Brahmi in July of 2013. They theorize why some parties were successful in the post-revolution context and others were not. They narrate the proposal of the technical government solution by Hamadi Jebali and offer some explanations as to why it was adopted. To date, the interviewing team has completed 58 oral history sessions with 41 narrators totaling 110 recorded hours. One session (Mounir Tlili, minister of religious affairs) is not included in this archive due to trouble with the audio recording. 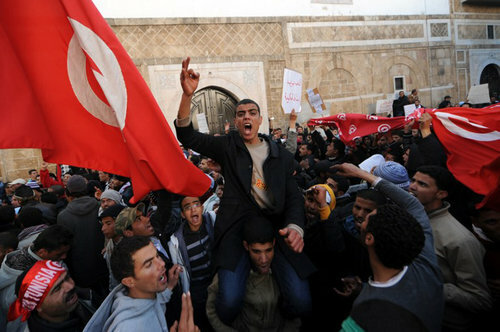 In late 2010 and early 2011, popular demonstrations beginning in the small city of Sidi Bouzid in central Tunisia swept to its capital and to major cities and towns across the country. Protestors called for dignity, jobs, an end to corruption, and for the oligarchic president Zine El Abidine Ben Ali to step down. On January 14, 2011—with the streets and the army against him—Ben Ali fled to Saudi Arabia, initiating a wave of uprisings in neighboring countries that became known as the Arab Spring. Succession became complicated in the aftermath of the president’s abdication. The country cycled through five governments—of Mohammed Ghannouchi (Ben Ali’s prime minister), Beji Caid Essebsi (February to December 2011), Hamadi Jebali (December 2011 to March 2013), Ali Laarayedh (March 2013 to January 2014), and Mehdi Jomaa (January 2014 to January 2015)—before free and fair elections were organized according to the objectives of the revolution. Two “national dialogues” took place, which engaged all parts of society including labor unions, lawyers associations, human rights organizations, veteran and emergent political parties, and various non-governmental organizations. At the end of the second national dialogue, a technocratic government (whose members were not affiliated with any political party) was formed to facilitate the process of setting up elections. This government would remain in power for a year only, and help stabilize the security and economic situations until an elected government took power. Mehdi Jomaa, minister of industry and trade in the Ali Laarayedh cabinet, was appointed as its prime minister. The technocratic government accomplished its mission, and Mr. Jomaa became one of the country’s most popular politicians. Though jihadist groups have since attacked two of Tunisia’s prominent tourist sites, the country has not experienced any further regime crises.